Home News Stories by run – Moonlight half marathon is coming! Stories by run – Moonlight half marathon is coming! It’s the middle of spring and the temperatures are gradually rising. After a wonderful weekend dedicated to the Garmin Venice Night Trail and the 9th edition of the Corrimestre, it’s time to run a longer distance: it’s time to Moonlight Half Marathon! 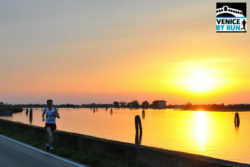 The VMCevents half marathon will take place on Saturday 27th May 2017: it will start just before the sunset and it will lead the participants through the charm of the Venetian Lagoon. The starting line is at the dam of Punta Sabbioni, which separates the historic coastline of Treporti from the one of Lido of Venice. From there, the race course continues along the lagoon crossing the center of Cavallino Treporti to reach then Piazza Mazzini in Jesolo where you will find the finish line. The Venice lagoon is about 50 km long and 10-12 km wide area formed in a recent geological period (about 6,000 BC), after the Wurm glaciation. During that period there was the definitive settling of the coastline of the high Adriatic Sea. In fact, as a result of the rise in temperatures during the Postglacial period and the consequent floods of the major alpine rivers (Brenta, Piave, Tagliamento) which convey a large amount of thin sedentary to the coast, the sea level grew till 65 – 110 meters and the coast line progressively moved northwards. All the runners of the Moonlight Half Marathon will see the result of this process: the shaping of a sort of large coastal lake with a low bottom full of islands, “velme”, “barene”. The average depth of the lagoon is in fact only 1.5 m, although the beds of the large canals can reach depths of over 20 m.
The lagoon is separated from the sea by islands, called “lidi”, interrupted by gaps of hydraulic connection, called “bocche di porto”. From here, it is possible to identify three basins, located in all the “bocche di porto”: Lido basin (northern), Malamocco basin (central), Chioggia basin (southern). 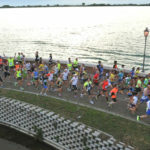 By running the Moonlight half marathon you will visit the northern basin of the Venice lagoon, commonly called by Venetians “laguna nord”: it is a very rich place both from the naturalistic and environmental point of view. In this area of the lagoon, in fact, there are the ancient roots of Venetian civilization with its first settlements that subsequently moved to the center of the lagoon (where they are today). So with the Moonlight half marathon you will live a kind of backward journey… a real race against time!